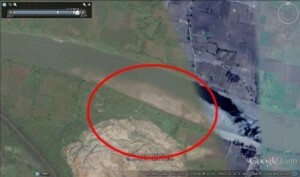 Kanhan River is one of my favorite river which is known for its sandy beds and glassy water. 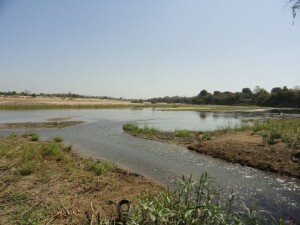 During winter and summer seasons the sandy beds of the river come up as water recedes. During this period the flow of river finds its way through sand beds and develops unique patterns of river flow. This pattern is very regular and it also feeds river bed farming on the sandy beds of the river. 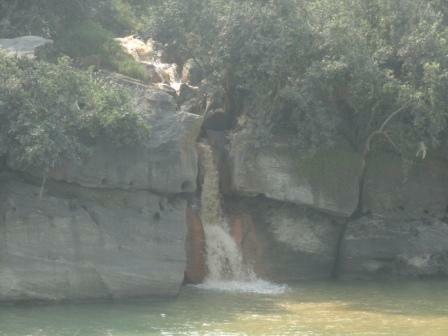 However this character of the river gets adversely altered as it passes the Khaperkheda Thermal Power Station (KTPS). 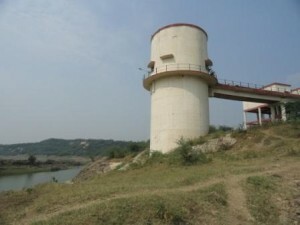 This coal based thermal power station is situated exactly on the right bank of the river. Its chimneys and cooling tower rise from the ground and touch the blue sky. 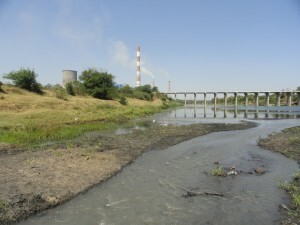 Downstream of the Khaperkheda thermal power station the drain which carries effluents – clearly untreated – from the plant enters directly into river Kanhan. The effluents are turbid and black in colour with load of suspended solids in it. 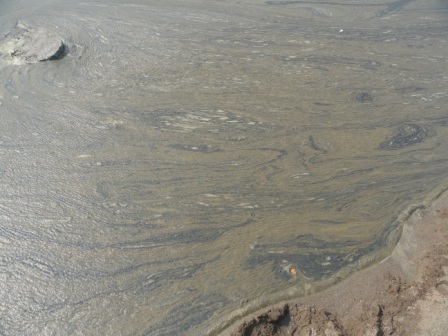 There is layer of black oil on the effluents. 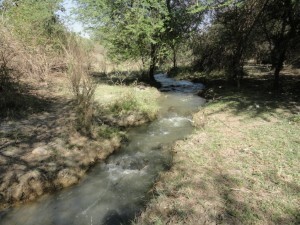 As this effluent stream meets the river, it turns the flowing river water into turbid and black in colour. 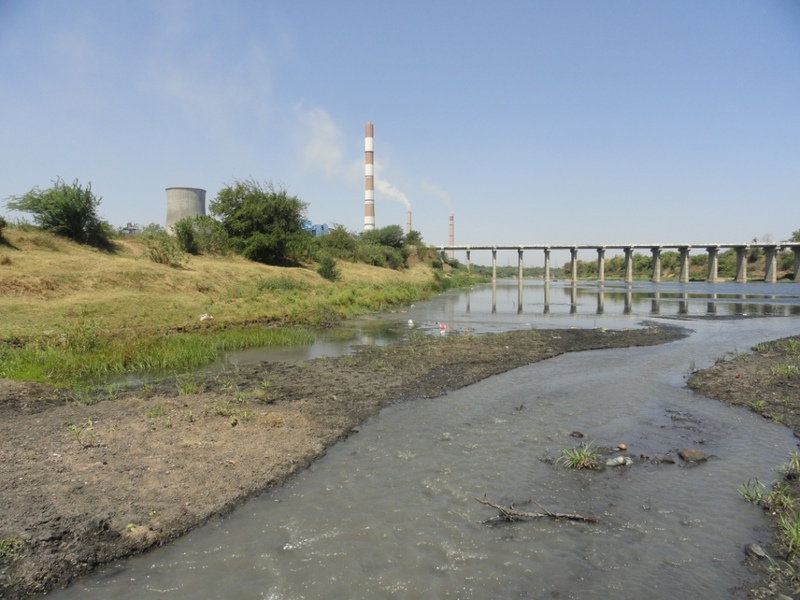 The suspended solids in effluents which are mainly fly ash and coal particles settle on the river bed and at the bottom, especially where the river flow slows down or becomes stagnant. The situation was same when I had visited the same place earlier on 19th Nov 2014. At present the quantity of effluents has been increased and the river bed has turned into black in colour. 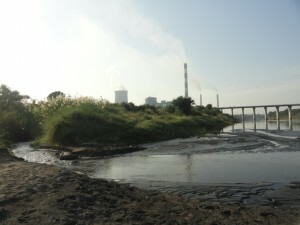 Left Image shows untreated effluents of KTPS meets river Kanhan in background there are chimneys of power plant. 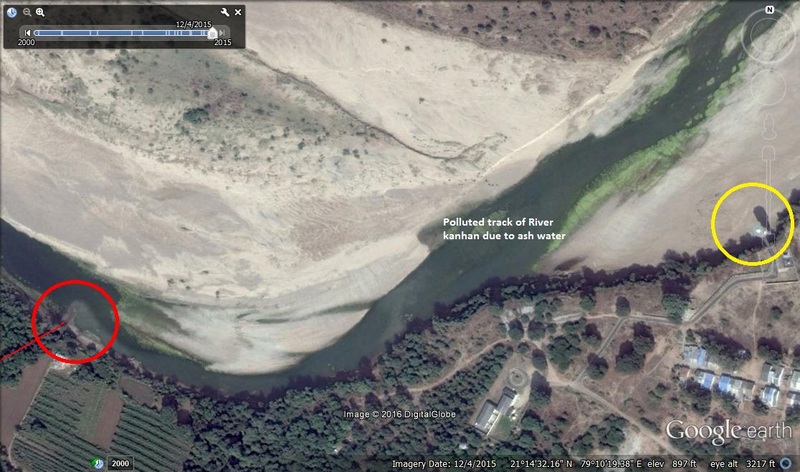 Right image shows untreated effluent of the plant meeting river kanhan and in background it is damaging riverbed farm. 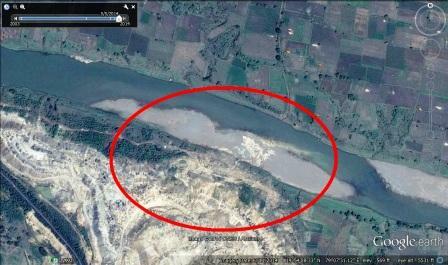 There is a riverbed farm exactly downstream of the point where the effluent drain of KTPS meets the river Kanhan. This farm is directly dependent on the Kanhan river water which is polluted by the KTPS’s untreated effluents. 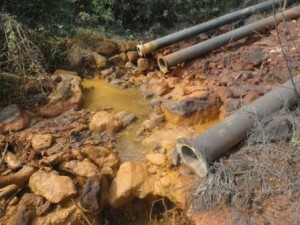 Due to this, the hazardous material from effluents settles into the soil and sand of the farm. This is resulted into blackening of the crops and farm land. 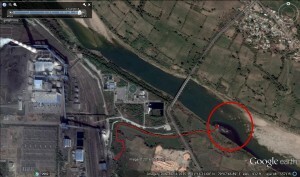 Left image shows Google earth image of KTPS with red line showing drain of effluent coming out from plant and meeting river kanhan indicated with red circle. At this point polluted black river water can be seen. Right image shows Google earth image of river kanhan which is showing black effluents in river after meeting of drain coming out from power plant. Being tolerant Indian citizens we can easily tolerate if river water is polluted, river bed farming is destroyed and fishermen whose entire livelihoods, dependent on the fish in the river,are destroyed by pollution. However, what if same water is consumed by Nagpur residents as drinking water? Yes, that’s exactly what is happening here. The extremely polluted water of river Kanhan after confluence of the effluent drain from KTPS flows nearly one km downstream to the confluence point with river Pench. 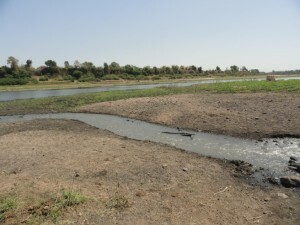 At this point there is small weir on river to secure the water source for the intake well of Nagpur drinking water supply. This is the point where polluted water of Kanhan River also gets accumulated and which is lifted for drinking water supply to Nagpur city. 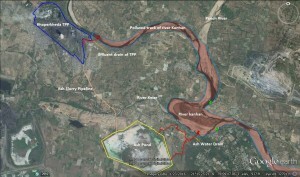 Left image shows Google earth image of KTPS (in blue outline) ash pond (in yellow outline), Kanhan river and after confluence Pench river (in faint red colour). 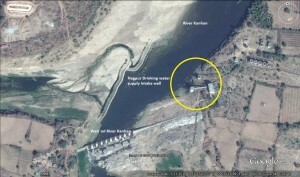 Right image shows Google earth image of Nagpur Municipal water supply intake well in downstream of confluence point of river kanhan to Pench. I am sure that there will good water treatment facilities provided by the Nagpur Municipal Corporation to treat raw water lifted from Kanhan River. 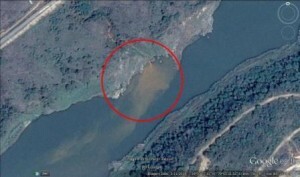 However I get worried as to whether the water treatment process will remove heavy metals from polluted water. 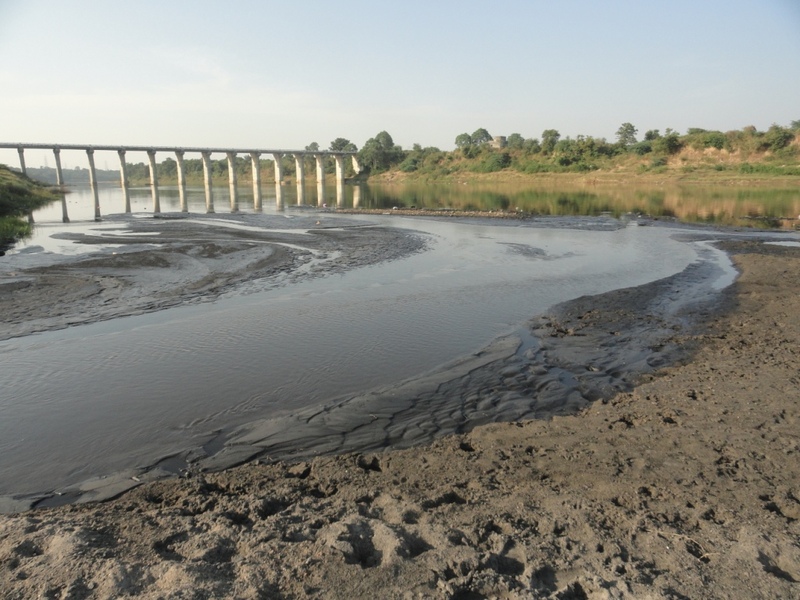 It is more likely that the untreated effluent of KTPS is having heavy metal constituents as it carries load of fly ash which is produced by burning of coal. After burning of coal the concentration of heavy metals automatically increases as the volume of coal get converted to a small volume of fly ash. So the water which is consumed by considerable areas of the city comes from River Kanhan and the city people need to think about this. 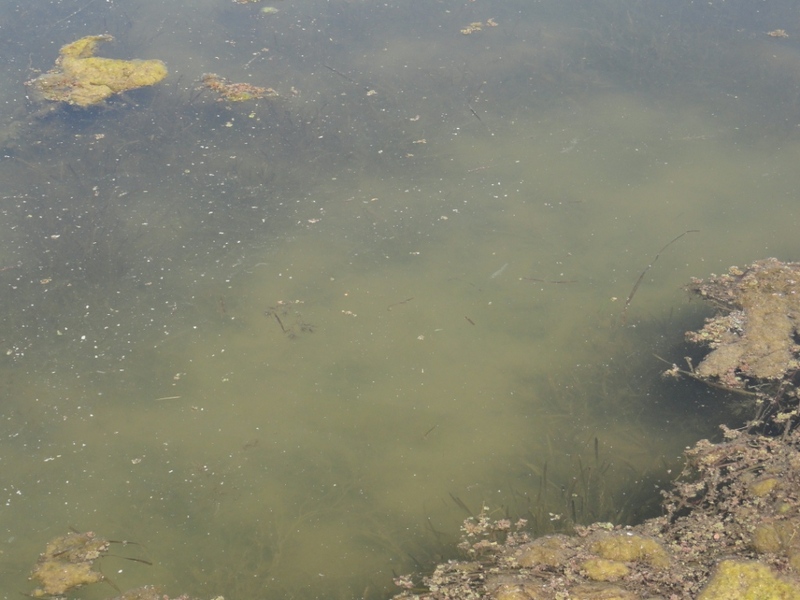 Left image shows drain with load of ash water coming out from ash pond of KTPS. 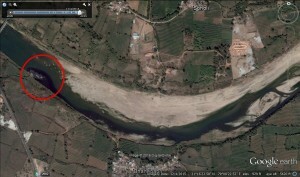 Right image shows same drain meeting river kolar at confluence point with river Pench and Kanhan. Left image showing Google earth image of ash water drain of KTPS meets river Kolar at red circle and water intake well of Kamathi Cantonment board at yellow circle. 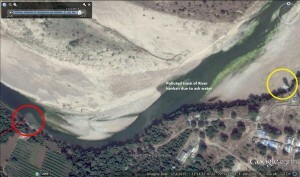 Right image showing settling of ash in bed of river Kolar at the point where ash drain meets river. I want to remind all of us that the intake well of Nagpur drinking water supply scheme is at confluence point of River Kanhan and Pench. 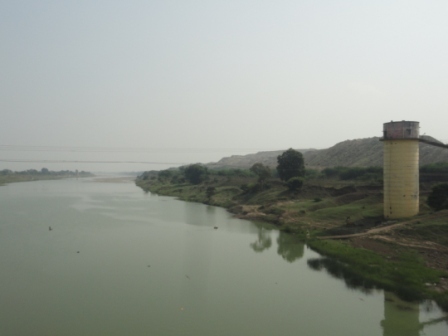 This confluence point receives polluted water of River Kanhan. According to the provisions of Water (Prevention and Control of Pollution) Act, 1974 and Air (Prevention and Control of Pollution) Act, 1981,industrial units need to take consent to operate from state pollution control board. The consent to operate is given with certain conditions.The Consent Appraisal Committee (CAC) of a state pollution control board is he authority that grants, forbids or refuses the consent to operate if any concerned industrial unit is not following conditions given under the Water and Air acts. The Consent Appraisal Committee of Maharashtra Pollution Control Board in its 14th Meeting held on 2nd Feb 2016 decided that the bank guarantee of KTPS(expansion) and KTPS (unit I to IV)should be forfeited. This decision was taken due to non-compliance by the thermal power station to the consent conditions. 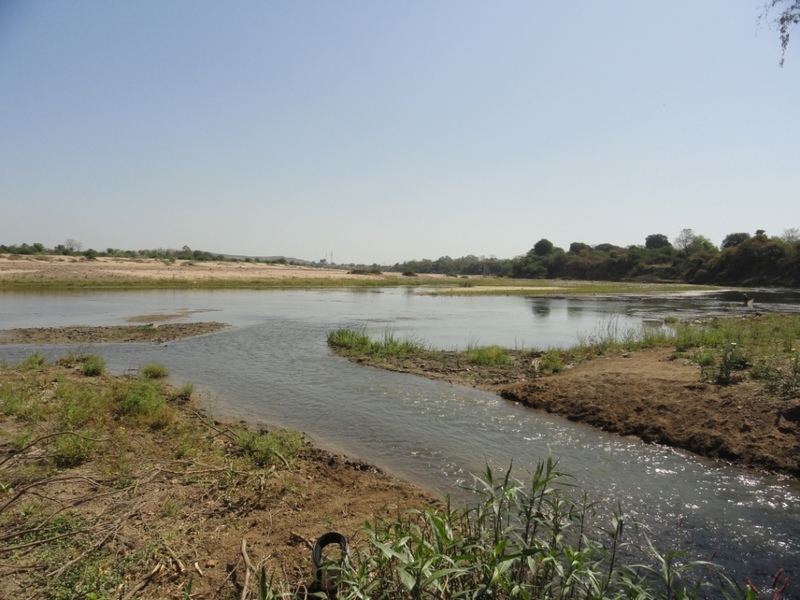 The committee also noted that the Joint Visit Sampling (JVS) analysis reports of air and water are exceeding the limits. As a result of this, the Managing Director of the Maharashtra Power Generation Corporation has been asked to appear in person for hearing before the Chairman of the Consent Appraisal Committee. With this, the CAC granted consent to operate to the thermal power station till 31st Dec 2016 by freshly extending all the bank guarantees. In the end MPCB issued consent to operate to the power station on 25th Feb 2016. My latest visit to the plant site and local area was on 23rd March 2016. 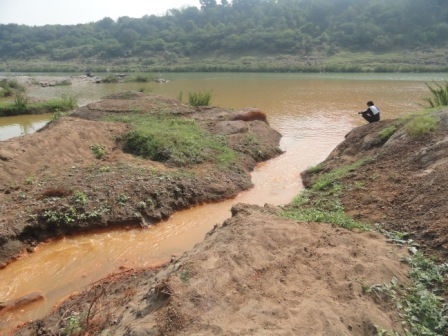 Nearly a month after grant of consent to operate to KTPS, the water pollution of river Kanhan by ash and untreated effluent was rampant. The situation had been the same when I had visited the same sites on 19th Nov 2014. 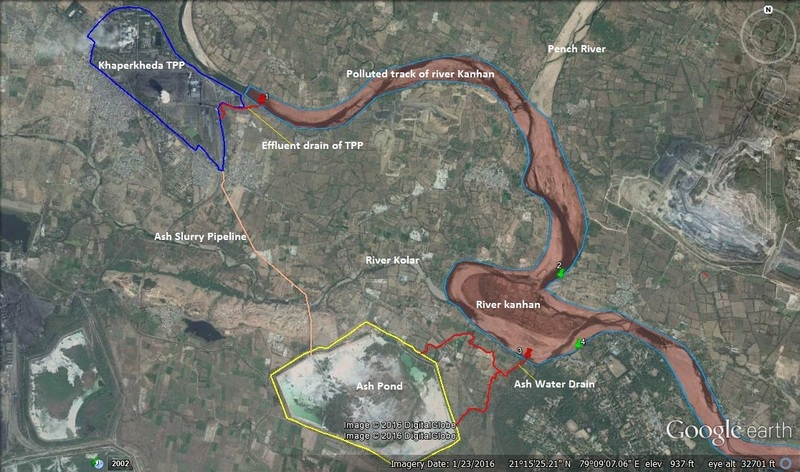 In conclusion, KTPS is adversely and knowingly polluting waters of Kanhan River which is source of drinking water of Nagpur city, Kamathi Cantonment Board and nearby villages on either banks of the river. 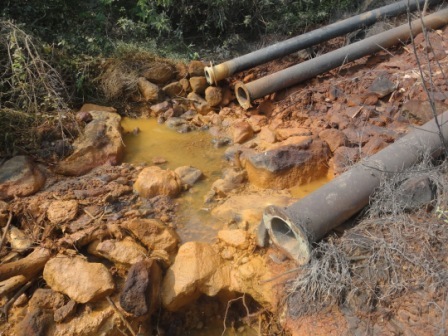 The actions taken by the state pollution control board are only limited to forfeiting bank guarantee of the plant. 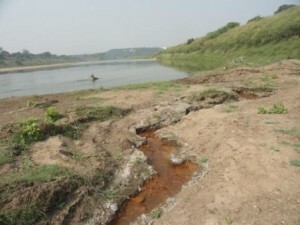 However the main issues of pollution remains unaddressed, and it is forcing people of Nagpur and surrounding areas to risk their lives by drinking such polluted water.Koradi Thermal Power Station which is close to Nagpur city is going to use its treated sewage water for cooling purposes and other plant operations in coming days. Ironically at present Nagpur people are drinking effluents of KTPS through River Kanhan. Thorat and Charde (2013): Physicochemical Study of Kanhan River Water Receiving Fly Ash Disposal Waste Water of Khaperkheda Thermal Power Station, India. International Research Journal of Environment Sciences Vol. 2(9), 10-15. Web Link: http://www.isca.in/IJENS/Archive/v2/i9/3.ISCA-IRJEvS-2013-160.pdf accessed on 1st April 2016. MPCB (2016): Renewal of Consent to Operate of Khaperkheda Thermal Power Station. Maharashtra state pollution control board, Government of Maharashtra. Web Link: http://mpcb.gov.in/envtdata/demoCMS/php/consentpdf/Consent_2016-02-25-11-23.pdf accessed on 2nd April 2016. 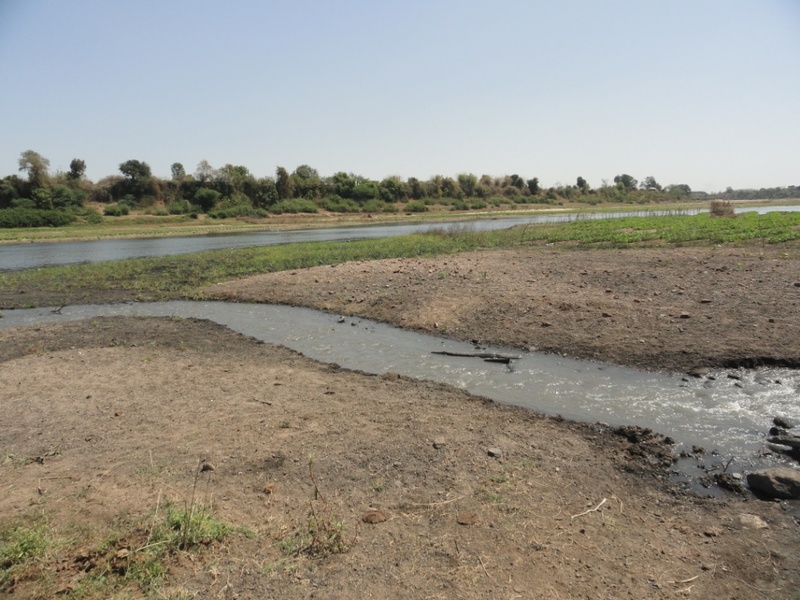 Nagpur Municipal Corporation source its drinking water from Kahan river which supplies drinking water to north, east, south and up to certain extent to central part of the city. There is also supply of drinking water from right bank canal of Pench project through Phase I, II, and III which collects water at Mahadula pumping station and supplies it to the city. MPCB asks industries to submit bank guarantees on the basisof capital investment, income and type of pollution that can be happen from respective Industrial units. This guarantee is collected during the time of delivery of consent to operate. If the industrial unit during the period of consent exceeds limits of pollution or violates conditions and pollutes the environment, then MPCB take action and the industry will forfeit the bank guarantee. Joint visit sampling is done jointly by officials from MPCB and respective plant authorities to inspect the issues of pollution under consent to operate conditions.